Emerita ProGest natural progesterone cream is the preferred choice for thousands of women to help maintain balance in their lives and harmony with their bodies. Each 1/4 teaspoon application of Emerita Pro-Gest Natural Progesterone provides 20mg of progesterone cream supplementation. The entire 2oz. tube contains 900mg of USP progesterone. 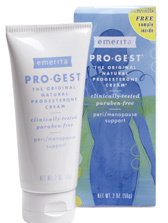 Emerita Pro-Gest Natural Progesterone cream has been praised by professionals and recommended by top physicians. Emerita ProGest progesterone is made up of small, fat-soluble molecules and is well absorbed through the skin. It is absorbed at first by the fat layers just under the skin and is then diffused throughout the body via blood circulation. Initially, in progesterone deficient individuals much of the progesterone is absorbed by the body fat. In time, fat levels reach saturation and continued doses result in increased blood levels of progesterone and a stronger physiological effect. Thus, some women notice results right away, while for others it may take up to three months. Since every woman's body is different, the correct amount of progesterone may vary. Therefore some women will require more than others. For many women, Emerita ProGest progesterone cream provides significant relief from symptoms related to shifts in the female hormones estrogen and progesterone. It is known that trans-dermal application allows for easier absorption because with any oral medication or supplement the health and state of the colon can compromise its effectiveness. Emerita natural progesterone cream provides a safe, pleasant and efficient way to help the body help itself, the way nature designed the body to work. Massage 1/4 to 1/2 teaspoon of Emerita progesterone cream cream into hands and body twice daily for 21 days. Discontinue use for 7 days and repeat. 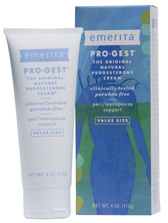 Apply Emerita progesterone cream to smooth skin areas - inner arms and thighs, belly, breasts, buttocks, face and neck. Individual needs may vary. Emerita progesterone cream is not recommended when pregnant or breastfeeding unless your health care provider specifically recommends it. Prop. 65 Warning: The product contains progesterone a chemical known to the State of California to cause cancer, birth defects or other reproductive harm.